Jose Manuel Collazo Playground is a hub of activity in North Philadelphia. After years of use, the playground fell into despair. With overwhelming support from this vivacious community, The Trust for Public Land helped transform the space into one that celebrates their unique identity. The neighbors' love for outdoor sports drives people to the handball and basketball courts, and now the site has opportunities for children and families to play and gather together. 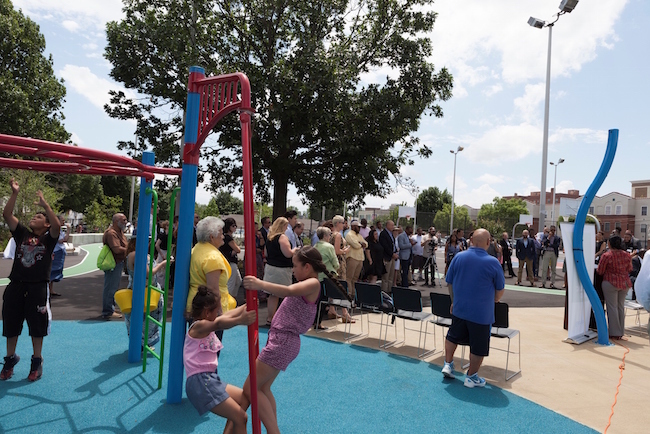 The community-led design for Collazo Playground revived the spirit of the old playground. As part of the new site, we expanded the handball and basketball courts to account for the high volume of players. We also installed new play equipment, a water spray ground, and a common area for community gatherings and events like outdoor bingo. The playground also includes a rain garden featuring native plants and underground water storage areas to manage stormwater runoff. The playground is currently open to the public. Mayor Michael Nutter and local community members taking steps to move towards a greener Philadelphia—and learning some fancy footwork in the process.